Our farm has been in our family for over 100 years. That is why we provide high-quality products at reasonable prices. At TLV (Triadelphia Lake View Farm) we believe in treating our patrons like one of the family. At Triadelphia Lake View Farm the customer always comes first. The farm started with the Brown family as a dairy farm in 1896. Linda and James Brown took over the farm from his parents in 1969. In 1984 the farm went into farmland preservation where the farm could never be sold to developers for houses. In 1985 the Brown's decided to go out of the dairy farming and try vegetables, farmers markets, pumpkin patch and planting Christmas trees. The first year of christmas trees the farm was planted and the drought hit and it was a complete loss of the crop. The Brown's were determined and planted again. Jamie Brown the son of Linda and James Brown incorporated into the Christmas Tree Business with his family. He was able to start diversifying into other areas like educational tours, camps and farm fresh meats. Currently the farm is involved with three Howard County Farmers markets, supply produce and meats to the Roving Radish in Howard County, partners with local restaurants to provide farm to table menus, have a pick your own pumpkin, corn maze and hayrides with educational tours. 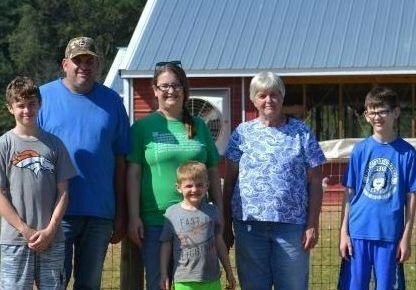 In 2018 the Brown's started there next project and bought turkeys to raise for thanksgiving and christmas. They also decided to provide ground turkey and turkey parts at the farmers markets and at the farm store. TLV is committed to producing the highest quality proteins at an affordable price. We provide an educational camp for adults and for children to learn what we do on our farm. We participate in farmers markets where you can find our produce, proteins, and flowers. Our community supported agriculture (CSA) is a 22 week program. Fall fun for the whole family, corn maze, pumpkin patch, hayrides and more. We raise turkeys for you to enjoy as the centerpiece for your holiday dinner. We offer several different varieties of live trees for you to choose from. We have been raising animals for over 100 years. The family farm where there is always something to get involved in. Farming has been in our blood for 5 generations. Our customers become our family. We strive for the best products so that you might enjoy and keep coming back. Jamie operates the farm and enjoys trying new ways to educate and make sure agriculture is still viable in Howard County. She has been working on the farm since she was 16 and is the co-owner and operator. She enjoys working in the greenhouse and watching the younger generations grow the working farm. Has been on the farm helping with anything that comes up.